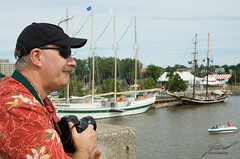 The expression on my friend's face was reserved for the Tall Ship Celebration in Bay City. But I had one of those days today with little but frustration and disappointment. Besides all the troubles at the office today, I discovered that the D2X (which just came back from service a little more than a month ago) seems to have little orange and blue "hairs" on the low-pass filter. The blower didn't seem to move them, so back to Nikon it is. It's rather depression to send your favorite body off...twice in as many months.